The 25XL is the result of over 25 years building coaching launches; fixing them; and listening to great coaches. It is the ultimate coaching tool. Construction: Vacuum bagged epoxy/fiberglass hulls and decks. Impact and sunlight resistant. Structural bulkheads create three watertight compartments in each hull. Comfort: The 25XL sports an adjustable front bench that can be substituted with pedestal seats if you wish. A rear bench is also available. 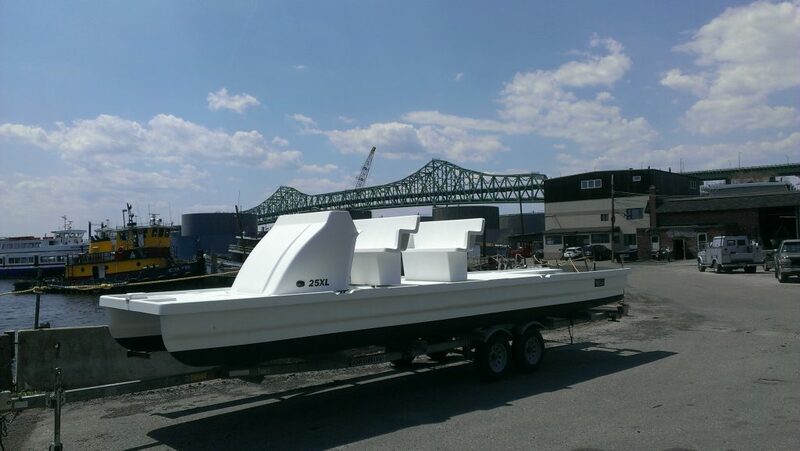 A hardtop bimini will soon be available – if coaching is your career, it only makes sense to protect yourself as much as is practical from the ravages of sun and weather. Ergonomic design spares your back and puts the things you need — strokewatch, clipboard, and more — right at hand. Rescue: We’ve designed these hulls to be slim and low wake when lightly loaded: even lower wake than our original 25C! But the same boat becomes a solid rescue platform when loaded down with up to three eights worth of rowers. Storage beneath benches. Steers fine without a rudder. A trailer is available for easy transportation. A smooth ride with advancements in the right places.